« More Thoughts & Facts on UKIP’s Abject Failure! EU Withdrawal or Renegotiation? A View! WHAT will become of the European Union? One road leads to the full break-up of the euro, with all its economic and political repercussions. The other involves an unprecedented transfer of wealth across Europe’s borders and, in return, a corresponding surrender of sovereignty. Separate or superstate: those seem to be the alternatives now. For two crisis-plagued years Europe’s leaders have run away from this choice. They say that they want to keep the euro intact—except, perhaps, for Greece. But northern European creditors, led by Germany, will not pay out enough to assure the euro’s survival, and southern European debtors increasingly resent foreigners telling them how to run their lives. This has become a test of over 60 years of European integration. Only if Europeans share a sense of common purpose will a grand deal to save the single currency be seen as legitimate. Only if it is legitimate can it last. Most of all, it is a test of Germany. Chancellor Angela Merkel maintains that the threat of the euro’s failure is needed to keep wayward governments on the path of reform. But German brinkmanship is corroding the belief that the euro has a future, which raises the cost of a rescue and hastens the very collapse she says she wants to avoid. Ultimately, Europe’s choice will be made in Berlin. Last summer this newspaper argued that to break the euro zone’s downward spiral required banks to be recapitalised, the European Central Bank (ECB) to stand behind solvent countries with unlimited support, and the curbing of the Teutonic obsession with austerity. Unfortunately, successive European rescue plans fell short and, though the ECB bought temporary relief by supplying banks with cheap, long-term cash in December and February, the crisis has festered and deepened. In recent months we have concluded that, whether or not Greece stays in the euro, a rescue demands more. If it is to banish the spectre of a full break-up, the euro zone must draw on its joint resources by collectively standing behind its big banks and by issuing Eurobonds to share the burden of its debt. We set out the scheme’s nuts and bolts below. It is unashamedly technocratic and limited, designed not to create the full superstate that critics (and we) fear. But it is plainly a move towards federalism—something that troubles many Europeans. It is a gamble, but time is running short. Rumours of bank runs around Europe’s periphery have put savers and investors on alert (see article). The euro zone needs a plan. Is the euro really worth saving? Even the single currency’s diehard backers now acknowledge that it was put together badly and run worse. Greece should never have been let in. France and Germany rode a coach and horses through the rules designed to prevent government borrowing getting out of hand. The high priests of euro-orthodoxy failed to grasp that, though Ireland and Spain kept to the euro’s fiscal rules, they were vulnerable to a property bust or that Portugal and Italy were trapped by slow growth and declining competitiveness. A break-up, many argue, would allow individual countries to restore control over monetary policy. A cheaper currency would help match wages with workers’ productivity, for a while at least. 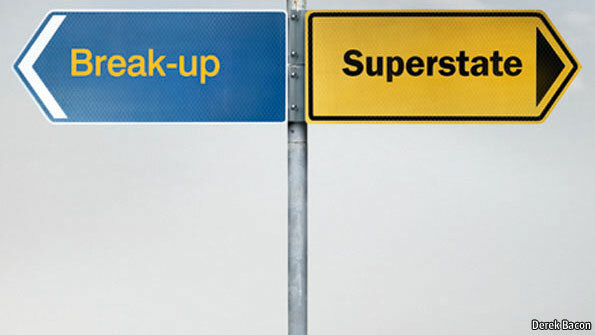 Advocates of a break-up imagine an amicable split. Each government would decree that all domestic contracts—deposits and loans, prices and pay—should switch into a new currency. To prevent runs, banks, especially in weak economies, would shut over a weekend or limit withdrawals. To stop capital flight, governments would impose controls. All good, except that the people who believe that countries would be better off without the euro gloss over the huge cost of getting there (see article). Even if this break-up were somehow executed flawlessly, banks and firms across the continent would topple because their domestic and foreign assets and liabilities would no longer match. A cascade of defaults and lawsuits would follow. Governments that run deficits would be forced to cut spending brutally or print cash. And that is the optimistic scenario. More likely, a break-up would take place amid plunging global share prices, a flight to quality, runs on banks, and a collapse in output. Devaluation in weak economies and currency appreciation in strong ones would devastate rich-country producers. Capital controls are illegal in the EU and the break-up of the euro is outside the law, so the whole union would be cast into legal limbo. Some rich countries might take advantage of that to protect their producers by suspending the single market; they might try to deter economic migrants by restricting freedom of movement. Practically speaking, without the movement of goods, people or capital, little of the EU would remain. The heirs of Schuman and Monnet would struggle to restore the Europe of 27 when it had been the cause of such mayhem—even if a euro-rump of strong countries emerged. Collapse would be a gift to anti-EU, anti-globalisation populists, like France’s Marine Le Pen. There would be so many people to blame: Eurocrats, financiers, intransigent Germans, feckless Mediterraneans, foreigners of all kinds. As national politics turned ugly, European co-operation would break down. That is why this newspaper thinks willingly abandoning the euro is reckless. A rescue is preferable to a break-up. But not just any rescue. Too much of the debate over how to save the euro puts the emphasis merely on a plan for growth. That would help, because growth makes debt more manageable and banks healthier. Mrs Merkel should have been more accommodating on this. But any realistic stimulus would be too modest to stem the crisis. The ECB could and should cut rates and begin quantitative easing, but official funds for investment are limited. More ambitious ways of boosting growth, such as the completion of a single European market for services, are sadly not even on the table. In any case, the euro zone’s troubles run too deep. Banks and their governments are propping each other up like Friday-night drunks. The ECB’s support for the banks cannot prevent the weak economies of Spain, Portugal, Italy and Ireland from enfeebling their banks and governments. For as long as bond yields are high and growth is poor, sovereigns will face doubt about their capacity to service their debt and banks will see loans go bad. Yet that same uncertainty pushes up sovereign yields and stops bank lending, further inhibiting growth. Fear that the state might have to deal with a banking collapse makes government bonds riskier. Fear that the state could not cope makes a banking collapse more likely. That is why we have reluctantly concluded that the nations in the euro zone must share their burdens. The logic is straightforward. The euro zone’s problem is not the debt’s size, but its fragmented structure. Taken as a whole, the stock of euro-zone public debt is 87% of GDP, compared with over 100% in America. Similarly, the banks are not too big for the continent as a whole, just for individual governments. To survive, Europe has to become more federal: the debate is how much more. A lot, according to some gung-ho federalists. For people like Germany’s finance minister, Wolfgang Schäuble, the single currency was always a leg on the journey towards a fully integrated Europe. In exchange for paying up, they want to harmonise taxes and centralise political power with, say, an elected European Commission and new powers for the European Parliament. Voters will be scared into grudging acquiescence precisely because a euro collapse is so terrifying. In time, the new institutions will gain legitimacy because they will work and Europeans will begin to feel prosperous again (see article). Yet to see the euro crisis as a chance to federalise the EU would be to misread people’s appetite for integration. The wartime generation that saw the EU as a bulwark against strife is fading. For most Europeans, the outcome of the EU’s most ambitious project, the euro, feels like misery. And there is no evidence that voters feel close to the EU. The Lisbon treaty and its precursor, the EU’s aborted constitution, were together rejected in three out of six referendums; ten governments reneged on promises to put constitutional reform to the vote. The parliament is hopelessly remote. Another version of the superstate is to accept that politics remains stubbornly national—and to increase the power of governments to police their neighbours. But that, too, has problems. As the euro crisis has shown, governments struggle to take collective decisions. The small countries of the euro zone fear that the big ones would hold too much sway. If Berlin pays the bills and tells the rest of Europe how to behave, it risks fostering destructive nationalist resentment against Germany. And like the other version of the superstate, it would strengthen the camp in Britain arguing for an exit—a problem not just for Britons but for all economically liberal Europeans. That is why our rescue seeks to limit both the burden-sharing and the concession of sovereignty. Rather than building a federal system, it fills in two holes in the single currency’s original design. The first is financial: the euro zone needs a region-wide system of bank supervision, recapitalisation, deposit insurance and regulation. The second is fiscal: euro-zone governments will be able to manage—and reduce—their fiscal burdens only with a limited mutualisation of debt. But in both cases the answer is not to transfer everything to the EU level. Begin with the banks. Since the euro’s creation, European integration has moved farthest in finance. Banks sprawl across national borders. German banks fuelled Spain’s property boom, while their French peers funded Greece’s borrowing. The answer is to move the supervision and support of banks (or at least big ones) away from national regulators to European ones. At a minimum there must be a euro-zone-wide system of deposit insurance and oversight, with collective resources for the recapitalisation of endangered institutions and regional rules for the resolution of truly failed banks. A first step would be to use Europe’s rescue funds to recapitalise weak banks, particularly in Spain. But a common system of deposit insurance needs to be rapidly set up. These are big changes. Politicians will no longer be able to force their banks to support national firms or buy their government bonds. Banks will no longer be Spanish or German, but increasingly European. Make no mistake: this is integration. But it is limited to finance, a part of the economy where monetary union has already swept away national boundaries. The fiscal integration can also be limited. Brussels need not take charge of tax and spending, nor need Eurobonds cover all government debts. All that is required is for overindebted countries to have access to money and for banks to have a “safe” euro-wide class of assets that is not tied to the fortunes of one country. The solution is a narrower Eurobond that mutualises a limited amount of debt for a limited amount of time. The best option is to build on an idea put forward by Germany’s Council of Economic Experts, to mutualise the current debts of all euro-zone economies above 60% of their GDP. Rather than issuing new national government bonds, everybody, from Germany (debt: 81% of GDP) to Italy (120%) would issue only these joint bonds until their national debts fell to the 60% threshold. The new mutualised-bond market, worth some €2.3 trillion, would be paid off over the next 25 years. Each country would pledge a specified tax (such as a VAT surcharge) to provide the cash. So far Mrs Merkel has opposed all forms of mutualisation (and did so again this week—see Charlemagne). Under our scheme, Germany would pay more on a slug of its debt, subsidising riskier borrowers. But it is not a move to wholesale fiscal federalism. These joint bonds would not require intrusive federal fiscal oversight. Limited in scope and time, they do not fall foul of Germany’s constitutional constraints. Indeed, they can be built from last autumn’s beefed-up “six pack”, which curbs excessive borrowing and deficits; and January’s fiscal compact, which enshrines budget discipline in law and is now being ratified across the euro zone. Even this more limited version of federalism is tricky. The single banking regulator might require a treaty change, which would be difficult when ten EU countries, including Britain, are not members of the euro. The treaty setting up Europe’s bail-out fund would also have to be changed to allow money to be supplied directly to banks. Countries would have to find convincing ways to commit future governments to pay their share of the interest on the Eurobonds. Greece’s debts so outweigh its economy that it would need a further rescue before entering any mutualisation scheme—though the sum involved is small on a continental scale. So it is a long agenda; but it is more manageable than trying to redesign Brussels from the top down, and it is less costly than a break-up. Saving the euro is desirable and it is doable. One question remains: will Germans, Austrians and the Dutch feel enough solidarity with Italians, Spaniards, Portuguese and Irish to pay up? We believe that to do so is in their own interests. The time has come for Europe’s leaders, and Mrs Merkel in particular, to make that case. The threat of Greece exiting the euro is exposing flaws in how banks and governments protect European depositors’ cash in the event of a run. National deposit-insurance programs, strengthened by the European Union in 2009 to guarantee at least 100,000 euros ($125,000), leave savers at risk of losses if a country leaves the euro and its currency is redenominated. The funds in some nations also have been depleted after they were used to help bail out struggling lenders, leading policy makers to consider implementing an EU-wide protection plan. With European officials openly discussing a Greek exit from the euro for the first time, savers in Spain, Italy and Portugalmay start to withdraw cash on concern that those countries will follow Greece and their funds will be devalued with a switch to a successor currency. None of those nations has the firepower to handle simultaneous runs on multiple banks. Households and businesses pulled 34 billion euros from Greek banks in the 12 months ended in March, 17 percent of the country’s total, according to the ECB. Deposits at banks in Greece, Ireland, Italy, Portugal and Spain fell by 80.6 billion euros, or 3.2 percent from the end of 2010 through the end of March, ECB data show. German and French banks increased deposits by 217.4 billion euros, or 6.3 percent, in the same period. Bank-deposit data for April will be released starting this week. Even after boosting capital and building up liquidity buffers of more than 1 trillion euros over the past two years, lenders may be unable to survive a system-wide bank run without political intervention, either in the form of a pan-European deposit guarantee or an expanded bank-bailout facility, Jernej Omahen, an analyst at Goldman Sachs Group Inc. (GS) in London, said in a May 22 report to clients. “An EU-wide deposit-guarantee fund may prove to be the most important tool to preserve financial-market stability if Greece were to leave the euro area,” said Tobias Blattner, an economist at Daiwa Capital Markets in London. European leaders discussed regionalizing deposit guarantees as part of talks on reigniting growth in the euro area, EU President Herman Van Rompuy said after a summit in Brussels on May 24. French President Francois Hollande said after the meeting that he and Italian Prime Minister Mario Monti backed the plan. European Central Bank Executive Board member Peter Praet called for a similar scheme on May 25 as part of a financial union with one authority responsible for supervision and resolution of cross-border banks. Policy makers also may consider cutting interest rates, buying more bonds through the EU’s Securities Market Program and starting a third longer-term financing operation to stem concerns that the currency may break up, Stefan Nedialkov, a London-based analyst at Citigroup Inc. wrote in a May 17 note. Savers pulled 27 percent of deposits from Argentina’s banks between 2000 and 2003 during a currency crisis, Nedialkov wrote. If Ireland, Italy, Portugal and Spain follow a similar pattern, about 340 billion euros could be withdrawn, he estimated. Companies have already started to remove cash from southern Europe as soon as they earn it. Many already are sweeping funds daily out of banks in those countries and depositing it overnight with firms in the U.K. and northern Europe, according to David Manson, head of liquidity management at Barclays Plc in London, who advises company treasurers. EU policy makers last overhauled rules on deposit-guarantee plans in 2009 after a global banking crisis exposed discrepancies in the level of protection offered in different countries. They raised the minimum amount insured to 100,000 euros a person from 20,000 euros. National governments were also told to ensure that their programs were pre-funded with contributions from lenders rather than topped up after a bank collapses. The way lenders are charged for the funds and how much they have to pay varies from nation to nation. No provision was made for the possibility that a country would leave the euro, said two people involved in establishing the rules who declined to be identified because the talks were private. That provides little assurance to depositors concerned that their savings in euros may be redenominated as well as that banks may fail. “For a pan-euro deposit-guarantee scheme to ‘firewall’ deposits in Italy, Ireland, Portugal and Spain following a potential Greek exit, it needs to explicitly cover redenomination risk as well,” Ronit Ghose, a Citigroup analyst based in London, wrote in a May 25 report. That would cost more than 150 billion euros, he estimated. The European Commission said in a July 2010 report that a pan-European deposit guarantee would be cheaper and more effective than individual national facilities, though legal issues made it a “longer-term project” to be reviewed by 2014. The EU currently is weighing plans to force national governments to ensure that a minimum amount of money is immediately available to stabilize a bank in the event of a run. Under the proposals, to be published by the commission June 6, funds would be raised through annual contributions by banks. Lenders could be tapped for further financing in an emergency, then national central banks, before governments would be obliged to lend to each other as a last resort. Member states could merge these requirements with existing national arrangements to guarantee bank deposits, and would also be required to pool financial resources when a cross-border bank is on the point of failure, according to a draft of the plans obtained by Bloomberg News on May 25. In the meantime, concern is rising that existing national funds may struggle to honor their guarantees should the crisis worsen and sovereign borrowing costs remain elevated. Yields on 10-year Italian government bonds have jumped 1.09 percentage points to 5.77 percent from a March 9 low for the year. Their Spanish equivalents have increased 1.45 percentage points to 6.45 percent over the same period. “Guarantees are still provided locally, by governments and agencies that have credit risk, reducing the value of the insurance,” Jonathan Glionna, a London-based analyst at Barclays, wrote in a May 22 note to clients. Spain has dipped into its guarantee fund, which stood at 6.6 billion euros in October, to cover loan losses for buyers of failed banks. It used the facility to inject 5.25 billion euros into Caja de Ahorros del Mediterraneo when it agreed to sell it to Banco Sabadell SA in December. The deposit-guarantee program will also reimburse the bank-rescue fund for the 953 million euros it paid for a stake in Unnim Banc, which was sold to Banco Bilbao Vizcaya Argentaria SA. (BBVA) The country had 931.2 billion euros of deposits at the end of March, according to ECB data. Italy’s deposit-insurance program is still unfunded, with banks pledging to contribute if and when necessary. Silvia Lazzarino De Lorenzo, a spokeswoman for Roberto Moretti, chairman of the Interbank Deposit Protection Fund, declined to comment. The country had 1.1 trillion euros of deposits at the end of March, ECB data show. Portugal has a deposit fund of 1.4 billion euros collected from banks through annual contributions, according to Barclays. The country’s total deposits stood at 164.7 billion euros at the end of March, according to the central bank. One option for an EU-wide insurance plan would involve Europe’s largest banks contributing 107 billion euros, or 1.5 percent of eligible deposits, to a fund over 10 years, according to proposals by Dirk Schoenmaker and Daniel Gros of the Centre for European Policy Studies, a Brussels-based research group. Implementing such a program wouldn’t be difficult technically because it would be only a matter of harmonizing existing standards, said Simon Gleeson, a financial-services lawyer at Clifford Chance LLP in London. This entry was posted on 25/05/2012 at 09:27	and is filed under UKIP. Tagged: Cam Taylor, Economis The, EU Breakup, EUro Breakup, European Union, Germany, Greece, The Economist, UKIP. You can follow any responses to this entry through the RSS 2.0 feed. You can leave a response, or trackback from your own site. thanks I have added the article you suggested with a credit to yuou as the source.